The Ancient Egyptians used art to idealise the subject being depicted. Therefore the paintings of Ancient Egypt, seen on tomb walls, always conveyed a happy and orderly lifestyle. All figures were depicted as young and healthy and no one suffered from a middle-age spread or appeared old! Traditionally, the figures of humans were drawn in profile but with one eye and both shoulders shown frontally. The largest figure shown on tomb paintings was that of the occupant - regardless of the actual height of the deceased. Ancient Egyptian art is characterized by the use of simple lines and simple shapes to create the concept of order and balance. Horizontal and vertical reference lines were used by artists in order to maintain correct proportions of the images. This art style resulted in somewhat stilted forms which were caused by a lack of perspective. This art style was used for thousands of years. The only change was during the transient Armana art period. The colors used in paintings traditionally showed that the body of a man was painted as a dark reddish-brown color whereas the body of a woman was painted as lighter, yellowish-brown color. These differences in colors represented the mainly outdoor life of a man as opposed to the more secluded lifestyle of a woman. 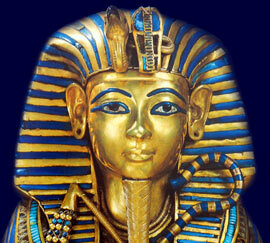 Six basic colors were used in Ancient Egyptian art - white, black, red, yellow, blue and green. A tiny pestle and mortar was used for grinding colors. The colors used were symbolic and all had different meanings. The symbolism of the colors was used to great effect when depicting the images and characteristics of the various Ancient Egyptian gods and goddesses. The statues and bas-reliefs which decorated the temples and tombs of Ancient Egypt and made of sandstone, limestone or wood were usually painted when they were completed. The natural color of stones such as granite, basalt, diorite and alabaster were also used instead of paint. The sculptor therefore produced the statue or prepared the tomb surface and his work was followed by that of the painter. Gifted artists were adept at both sculpting and painting. The style of drawing and composition was taught by constant practise. The master would set his students the task of copying the same image repeatedly, until an exact replica could be reproduced. Once the basic drawing and composition skills had been learnt then the student would study people as stylised likenesses would need to be reproduced reflecting the visual impression of the subject being painted or sculptured. The movements and characteristics of different kinds of animals were also studied. Ancient Egyptian art students reproduced their work in black and the master corrected any errors in red ink. Students made their first attempts upon slabs of limestone or on drawing boards and any item of no value. Reeds were used as tools to paint with. The end of the reeds were dipped in water creating brushes which varied in size according to the size of the stem. The artists used wooden palettes oblong in shape which contained a groove where the brush could be rested. A cup of water was also required to clean the brush. All subjects were depicted in profile against a flat background. Their object, therefore, was to select forms which presented a characteristic outline capable of being reproduced in pure line upon a flat surface. The head was not drawn as full face, it was drawn in profile but with a full-face eye. This was necessary as a person cannot be satisfactorily reproduced just by the use lines as the form of the forehead, nose and the ear, disappear when the head is drawn full face. The two arms had to be visible to right and left of the body. The body was depicted in three-quarters view. The legs show to the best advantage when seen sidewise, so they are always depicted in this style. The art style of the Ancient Egyptians therefore used a combination of all these views of their subjects. The figures and images therefore produced by the Ancient Egyptians used their own rules of perspective, completely different to modern perspective rules.